yesterday I observed the star, starting with 150 l/mm grating (already intalled), then with 1200 l/mm one. Photometry V (it's difficult for me to estimate possible systematic errors, so I did't add the error bars). Left group is related to the low-res spectroscopic observation period, right group to the mid-res one. Sending all data to your e-mail. I'm not at home for the moment, but when I come back I will try this target with eshel spectrograph. I've been proactive here a bit, did observe this star since April but seen no emission in the 6700-7000A range (have quite a few non-detections, not including here). The H-alpha peaks have varied somewhat (~15%) during these 3 x 1800 sec attempts. Sent the fits to database. However, for high resolution I'd guess the OH telluric regions and the LI 6707 was mentioned, and that highest resolution required to detect emission. Again, do have a few negative observations, question if needed in the database at all. If not, first I'd do noisy probes (3-4 minutes) and give high exposures when seeing anything. EDIT: the R~2600 was shot on MAY-13, mistake in the image title. Fits sent are correct. Last edited by Peter Somogyi on Sat Jun 03, 2017 4:10 pm, edited 1 time in total. By the way Paolo, congratulations for the Vmag serie! Thank you, I'm glad if our observations were useful in some way. The plot of single subexposure profiles shows a slight variation of the h-alpha emission R-peak during the observing session (while V-peak was rather stable). I wonder if it's real (so fast changes?). Peter, I need to improve my photometry practice. Anyway useful, I think, but I have only the V band filter. So, I have to be careful what reference stars colours and sometime is not possible for me in short time. Here I used the Mak 90 scope, SHV-H9 ccd camera and Baader V filter (I extracted the transmission curve, useful to calibrate the low-res profiles flux). Measures on 30 sec exposure time frames. Thank you Paolo for the explanation! That setup with the H9 must be quite powerful! I will open a thread for this topic on the mailing list soon. The graphical comparison of Halpha is very interesting, I think your arguments are very reasonable. What is the integration time of each? Your work, confirms that a star is very interesting. Congratulations ! It is a real stimulus to observe it. 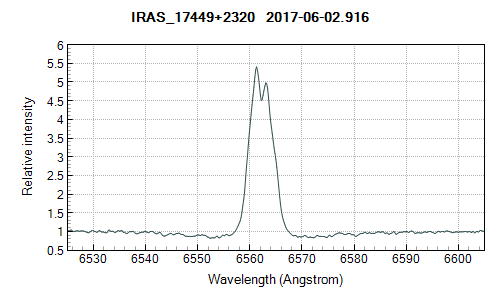 Spectrum for 2017-06-04 at R = 9000.